As the end of the financial year draws near it’s time to think about what strategies you can adopt to avoid paying more tax than is necessary for the 2015-16 year. This is simply a list of possibilities to direct your thinking and not all of these tips will be suitable for your particular situation – our goal is to have you asking yourself and your accountant the right questions. If you own one or more rental properties you may be able to claim many different expenses, so it may be helpful to bring forward any expenses before 30 June so you can claim them in the present financial year. For example, if you know that your investment property requires repairs or other works such as pest control, see if you can complete these tasks before the end of this financial year. If you have investment loans I encourage you to negotiate with your finance provider so that you can make upfront interest repayments on certain investments, for example on margin loans for shares. 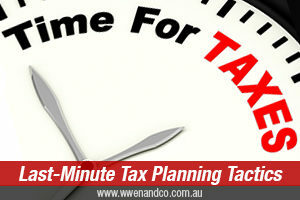 Most taxpayers can claim these deductions for up to 12 months in advance. A word of caution – you want to make sure that you review how you and your lender have allocated funds secured against your property, because a tax deduction is usually only allowed against the finance costs incurred for the purposes of earning assessable income from your investments. You may also want to note that deductions may not be available on funds you redraw from this loan for other purposes. If you know that in the next financial year you will be earning less (such as taking maternity leave, changing to part-time work etc), then deductible expenses that can be brought forward into the current financial year will provide more financial benefit. A notable exception is if you expect to earn more in the next financial year! In that case you may want to delay any tax-deductible payments until next financial year, when the financial benefit of deductions could be greater. Your personal circumstances will dictate which of these tactics are appropriate and the accountants at our Epping office can help you with this. If you have made and realised any capital gains from your investments this financial year, then those gains will be added to your assessable income. Therefore, think about selling any investments that are currently running at a loss before year-end. This allows the capital gains you made on your successful investments to be offset against the capital losses from the less successful ones, reducing your overall taxable income. You could apply a similar approach if you have carried forward any capital losses and wish to realise some gains at year end. Remember however, that for CGT purposes a capital gain generally occurs on the date you sign a contract, not when you settle on a property purchased. Therefore, when you are making a large capital gain toward the end of an income year, such as selling an investment property, knowing which financial year the gain will be attributed to is a great tax planning advantage. Small businesses with aggregate annual turnover of less than $2 million can immediately deduct assets costing less than $20,000 purchased since 7.30pm 12 May 2015. Consider if you could make concessional contributions of as much as you could by the 30 June. I encourage you to avoid letting tax considerations drive your investment decisions. Always check with your business or investment accountant to check if your tactics are right for your circumstances.